Remel London hosts Turn Up The Volume! 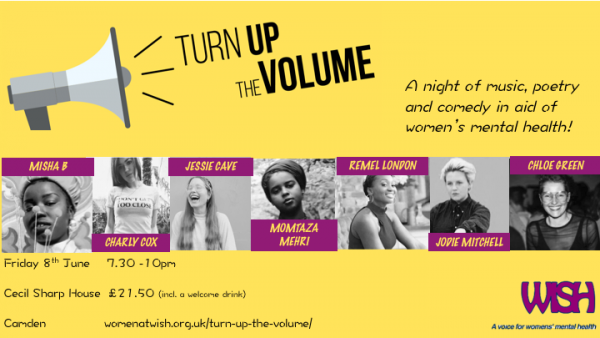 On Friday 8th June, Turn Up The Volume brings together an eclectic mix of female performers, from singers to comics, for the launch of Wish’s Women’s Mental Health Network (WMHN). Wish are the only national, user-led charity working with women with mental health needs in prison, hospital and the community. This night is raising money for our WMHN, which will work to improve the current mental health system and criminal justice system for women, including the community services these women need. Turn Up The Volume will be a display of brilliant female voices who all want to see a change in the mental health system. Expect performances from comedian Jessie Cave (8 out of 10 Cats does Countdown, Black Mirror, Harry Potter), poet Charly Cox, the soultastic Misha B and more! Wish are offering a small number of free tickets to this event for those on a low income or receiving benefits. Please email womensmhnetwork@gmail.com to find out more about receiving one of these tickets.